Really charming level! Your level design seems a little stronger to me (not that it was weak before). I remember this music from Juni's Winter Wonderland. It's a good track. I wanted to make a horrifying Saturnalia level for this competition, but couldn't get motivated enough. 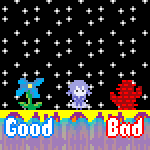 I did manage to make a really small level recently for Bluberry Jam, but I haven't promoted it anywhere because it's basically intended for people with no idea how to play the game and I was worried regular KS players would find it patronising. But maybe you'll like it, as a fellow 'press D to open your umbrella' sign placer. Reading that log of people playing YHtPtBNYitCB was fun too.